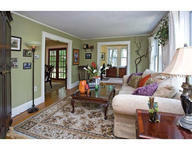 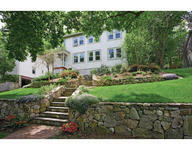 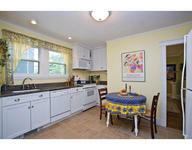 Elegant sunny 2008 renovated floor thru condo in heart of Newton Center. 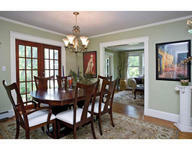 This condo features: 2 bedrms plus study/nursery off living rm, 1 bath with possible ½ bth addition, French drs off dining rooms open to flagstone patio for entertaining, molding & old world detail thru-out, hardwood floors, eat-in-kitchen has walk-in pantry & granite, updated windows, extra basement storage with W/D, landscaped private yard with stone walls, updated systems & roof , 2 parking with 1 garage space. Near "T"